Composition stoichiometry allows us to determine the number of atoms present in a collection of molecules, as shown in the following video. 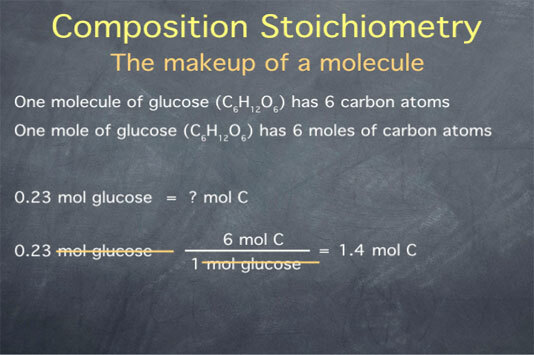 Composition stoichiometry refers to the atomic makeup of a molecule. For instance, we can say that one molecule of glucose has 6 carbon atoms, or we can say, equivalently, that one mole of glucose has 6 moles of carbon atoms. Say we are given a quantity of glucose expressed in moles, like 0.23 mol glucose, and we want to determine how many molecules of carbon atoms are present. We can start with our quantity, 0.23 mol glucose, and multiply it by the ratio of 6 moles of carbon atoms in every 1 mole of glucose. This gives us a number of 1.4 with units of "mol C atom", since the moles of glucose cancel. And that, in a nutshell, is composition stoichiometry. It allows us to convert between moles of a molecule and the moles of atoms that the molecule is composed of.